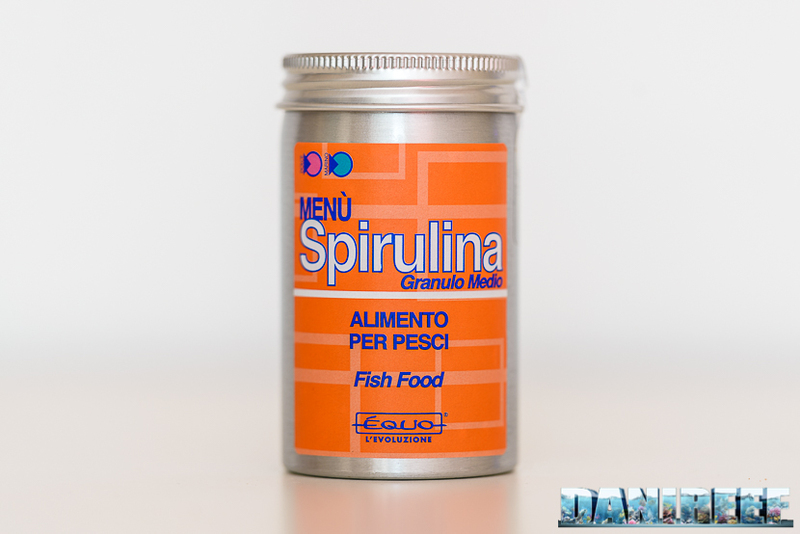 Menu Spirulina is the granular feed created by Equo for herbivorous fish. A few days ago, we talked about the vegetal feed Seaweed Extreme, released by Hikari, and today we have a chance to review the Italian response. As we said before, seaweeds are a necessity for many fish, such as the surgeonfish. 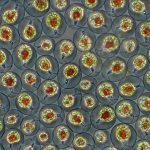 For a deeper look at surgeonfishes, we have a beautiful article written a few years ago that you can read here. 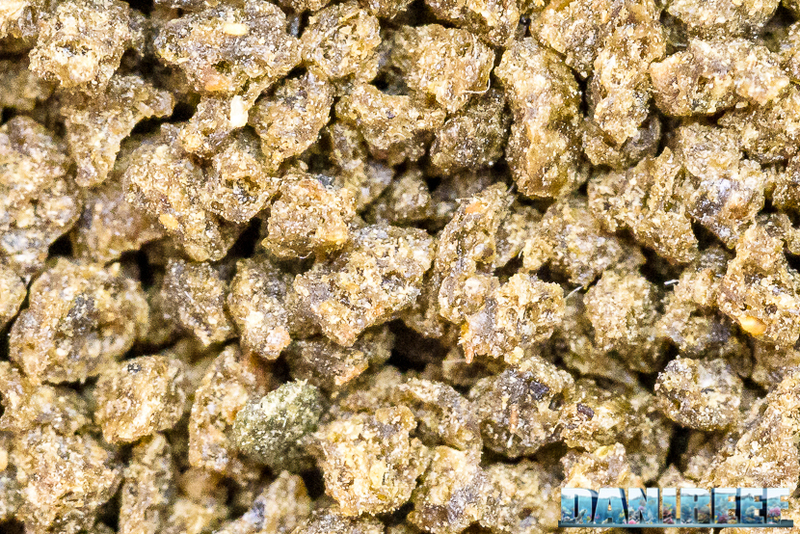 Our goal is to give a well balanced food to these beautiful fish; the feed has to have a high concentration of plant material and a low concentration of protein. 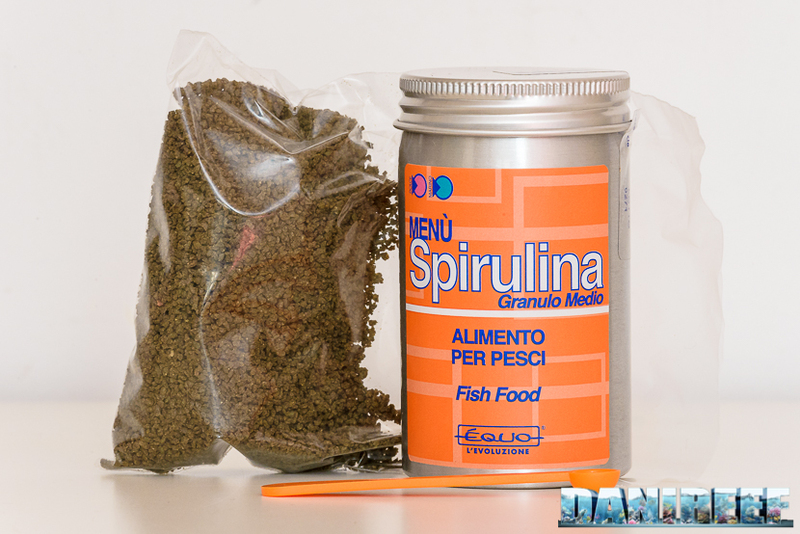 Equo Menu Spirulina is a granular feed available only in one size: the pellets are between 1.3 and 1.5 mm. These dimensions suit every aquarium fish except the smallest ones, but they have to be really small to not be able to eat it. It seems to be very appetizing, and I was pleasantly surprised to see that parts of the pellets remain on the surface, while the rest drops down. In this way, it’s easier for all the aquarium dwellers to reach the feed. 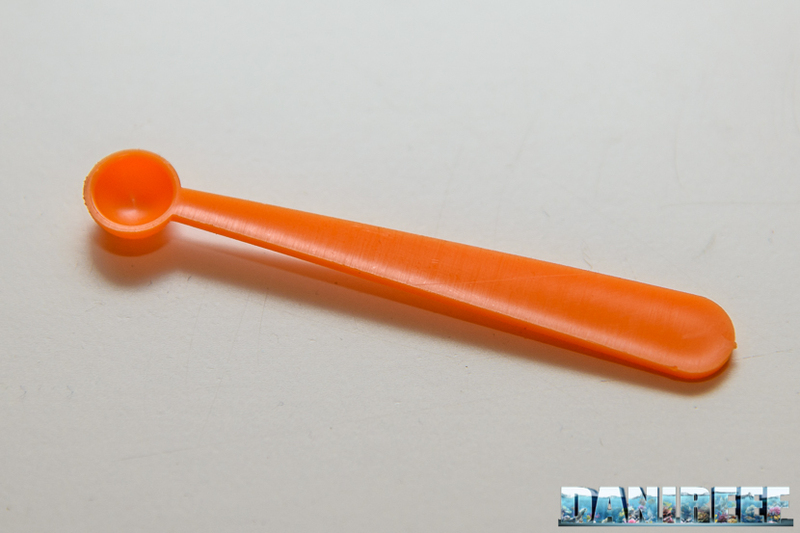 The container comes with a convenient spoon for the dosages; orange like the brand symbol. The following chart outlines the same analysis: The phosphorus level isn’t so low, but ashes are very low. The fats are contained, and the amount of calcium is quite good. 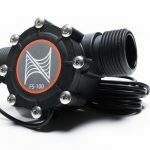 The moisture percent is also well contained, while the “other” part includes the important mineral salts, this high because of the seaweed in the feed. 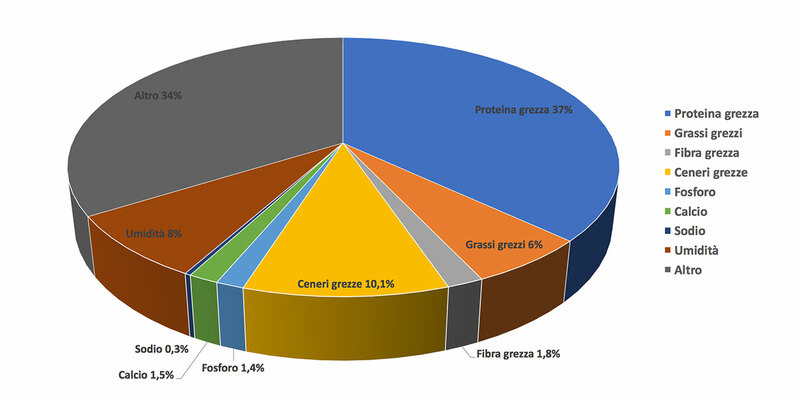 There are proteins, but in a lower quantity compared to a general pellet-type feed; Equo Menu Marino (review) had 55%. As with other vegetal feeds I’ve reviewed, I expected not to find them at all. 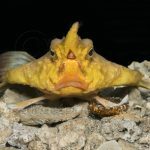 But their percentage is similar to the Hikari seaweeds in the Seaweed Extreme, probably to make it possible to use this feed as the only nutritional source, a well balanced diet for herbivorous fish. For example, among the surgeonfishes there’s the Acanthurus lineatus that tends to eat just seaweeds; it could benefit from this feed. We divided additives and vitamins in two graphics for easier viewing. 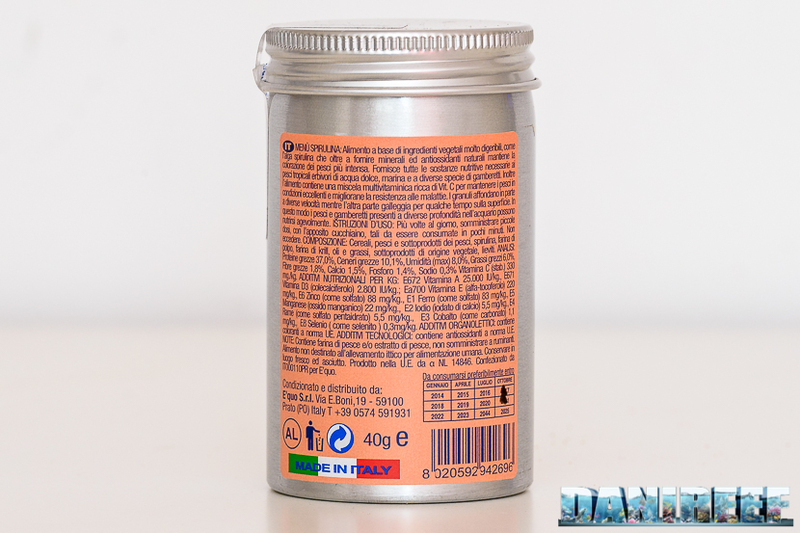 The C vitamin has been inserted in the additives because its quantity is given in mg per kg. Note that the vitamins are dominant. In particular, vitamin A, which facilitates a healthy growth, strengthens the sight, protects the skin and helps fertility. 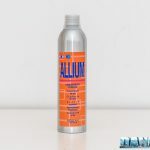 The various sulfates are only present in tiny quantities, though the iodine level is noteworthy. The mineral salts are less present than in a traditional granular feed. The package is made of aluminum, and the top screws closed, in order to keep the food cool and dry. In addition, the food is contained in a vacuum-sealed sack to combat humidity. Each package has the expiration date with year and month. 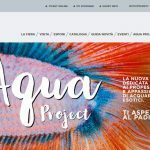 Equo Menu Spirulina is available in two packages: 40 grams (like the one in our pictures) or 400 grams.